Lora Klaviter of Homewood, Il and Chris Delhom, of New Orleans have set a date and decided upon BH&G as the venue for their Summer wedding and reception on September 19, 2009. They met in New Orleans while Lora was attending school here. 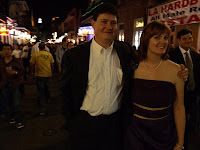 This photo was taken on Bourbon St, in November, 2007, when they had just started dating again. They plan a casual affair at BH&G, with their respective families and lots of children in attendance. Congratulations to Lora and Chris.